We were in the audience for Black Angels and Secrets: An Extraordinary Evening with the Daedalus Quartet, a January 13 concert—Friday the 13th, not coincidentally—presented by Penn’s music department, Bowerbird, and the Museum. 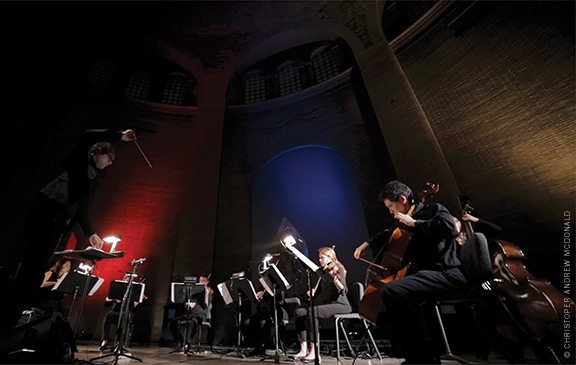 The evening featured the University’s resident string ensemble performing works by three Penn-affiliated composers that took dramatic advantage of the unusual acoustics of the 90-feet tall, domed rotunda. In addition to passages that mimicked the buzzing whine of a swarm of insects, those effects included musicians tapping the strings of their instruments with thimbles, striking gongs and playing them by drawing the back-side of the bow across the gong-edge, and using their bows to play on a “glass harmonica” made of water-tuned crystal glasses. The music’s otherworldly impact was further reinforced by the striking lighting design—which threw the musicians’ shadows up the wall of the rotunda behind them as they played like angry, wildly gesticulating spirits. After intermission, the quartet was joined by several guest string musicians, a saxophonist, and a soprano singer—not to mention the “whispered voices” of the 150 or so people in attendance—to perform Tonight We Tell the Secrets of the World, a “whisper play” by Scott Ordway G’11 Gr’13. Each audience member received a handout with a unique text addressing “three universal human themes: love, death, and god.” We were divided into sections—left, center, right—and told to start reading when a light was projected on the wall behind the musicians; red for love, blue for death, yellow for god. When you whisper your text, you are not asked to “perform,” or to direct your whispering to anyone else , the instruction sheet warned . Only the sum of our individual experiences will create a performance. The texts in the left “love” section, where our party was seated, were adapted from Layla and Majnun, a 12th-century work by the Persian epic poet Nizami Ganjavi, whose tale of thwarted lovers shares elements of Tristan and Isolde and Romeo and Juliet. The “death” section drew from inscriptions from the pyramid of King Unas at Saqqara, Egypt (2300 BCE) and the Book of the Dead of Ani (1250 BCE), while the “god” section drew on Sumerian creation myths from 3300-2000 BCE.